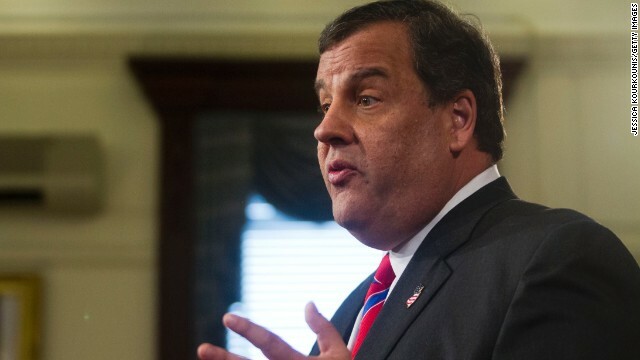 (CNN) - After first declining to take a position on the decision earlier this month, New Jersey Gov. Chris Christie said Thursday he backs the Supreme Court's ruling in favor of Hobby Lobby in its case against Obamacare. Asked about his thoughts on the case at a campaign stop in Iowa, Christie unveiled his support. "Do I support the Supreme Court decision in the Hobby Lobby case? I do," he said, according to video released by the Democratic group American Bridge. The governor made his comments in Marion, Iowa, while campaigning for incumbent Gov. Terry Branstad, a Republican. In a 5-4 decision announced a few weeks ago, the Supreme Court's conservatives essentially ruled that some for-profit corporations, like Hobby Lobby, have religious rights and cannot be required to pay to cover some types of contraceptives for their employees. The ruling was considered a big setback to the Affordable Care Act and the Obama administration. Republicans, including some potential presidential candidates, widely praised the decision, while Democrats were quick to blast it. Christie, however, declined to weigh in at the time the ruling was issued. Asked about the decision earlier this month, the governor argued it's best for political leaders to largely stay out of social issues. "I don't think that's the most central issue that we need to talk about this morning when you look at the challenges that face this country," he said. "If I allow people to put me in the box, then shame on me. I'm not a good politician. I'm not a good leader." Just because he hasn't see his little member in years thanks to his super sized stomach does he also agree that Viagra and other little blue pills are covered but women's contraceptives aren't and that's not a problem for him? Of course he is!! Jersey should be so proud, just like Alaska is so proud of Sara Palin once the people of this country really got know these wackos. of course he supports it? what kind of un-american person would support such an infringement on a persons freedom to practice their religion? oh yeah, the leftists that hate religion, and then try to use it in the discussion of our southern border invasion. talk about dishonest and deceitful, but par for the leftie course. Amazing. The man is still vying for an angle on the Presidency. Put an apple in his mouth; he's done. Who exactly let you decide who is and is not an American. I've seen plenty of issues and comments that you have sided with that are anathema to the positions of the founding fathers. As far as your religion goes, there are plenty of examples of un-American behavior in that crowd too. How exactly do you reconcile your hatred of liberals with the fact that Jesus and the founding fathers were liberals? Wanted to see which way the conservative donor base was leaning before he pandered to a side. Brave move fatso. Woman's contraceptives are still covered in most cases. Even in the Hobby Lobby case, only 4 out of 20 were objected to, those that caused a fertilized egg to stop developing. Why are you in here lying? Say What?? ?....Thankyou for "drawing a picture" for Marie MD. She is a bitter person that sees things a bit "foggy". Oh the courage he has! I am so proud of him! NOT!!! He is a weak and useless bully!! He has no convictions and would sell out his values for a dollar. Of course Christie supports Hobby Lobby! The entire agenda of the conservative Republicans is to mix church and State and have the US looking more like Iran!